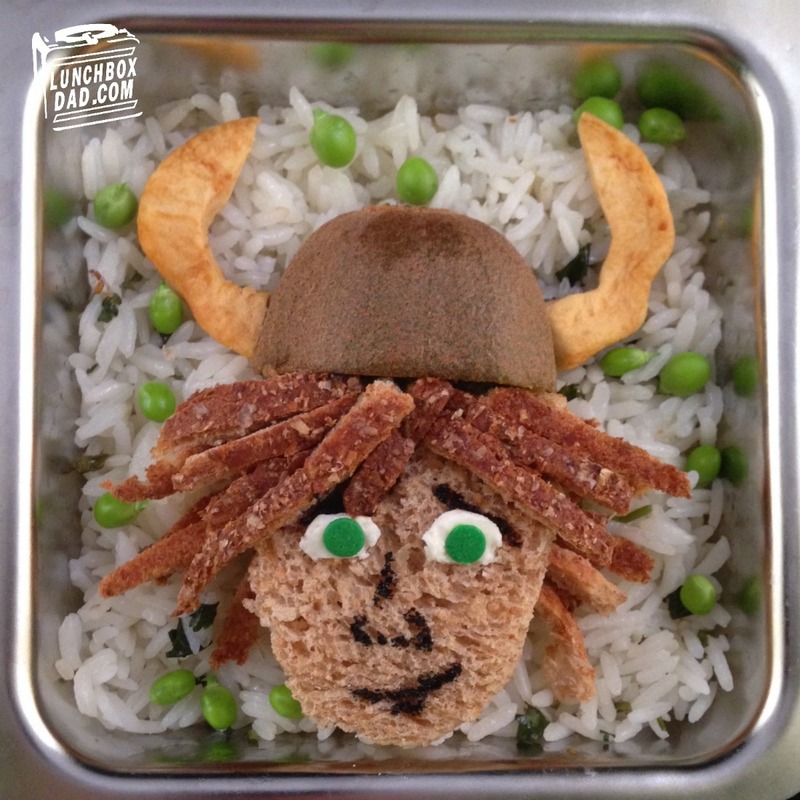 Year 2, Week 36: How to Train Your Dragon Lunch. It's the last week of school which means its the last lunch for another school year. To be honest, I was feeling out of ideas for this lunch but I think it turned out alright. It was one of the more difficult lunches that I have made so far, but I'm not really sure why. Sometimes it just works out that way. How to Train Your Dragon 2 will be out soon so I thought this would be a great way to end the year. I'm sure I'll be taking my kids to go see it so this is a little preview for my daughter. I used an unusual fruit called a Kiwano melon in this lunch because it looked sort of like a dragon and also looks very medieval. It tastes really good as well! The lunch is made in a Planetbox lunchbox. 1. Place rice or other background in main dish of container. Slice kiwi in half and place in rice. Cut dried apple in half and put pieces as horns on the side of the kiwi. 2. Cut face shape out of bread. Repeat. You should be able to get both pieces out of one slice of bread. Trim crust and cut into narrow strips. Cover one piece of bread with peanut butter and arrange some strips sticking out the sides. Put second piece of bread on top. Spread a little peanut butter at the top of the head and arrange more pieces of crust to look like hair. Put two dabs of cream cheese on face and two green sprinkles on the cream cheese. Finish facial features with black and brown food coloring. Place face in container just below kiwi. 3. 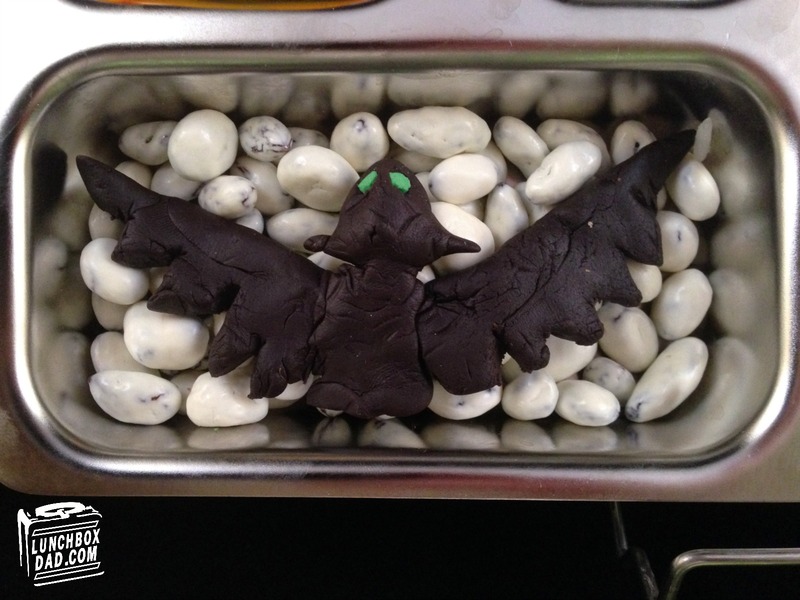 Use black modeling dough to make dragon silhouette of Toothless. Place two green sprinkles as eyes. Drop yogurt covered raisins in side dish and place dragon on top. 4. Slice mango and put pieces in second side dish. 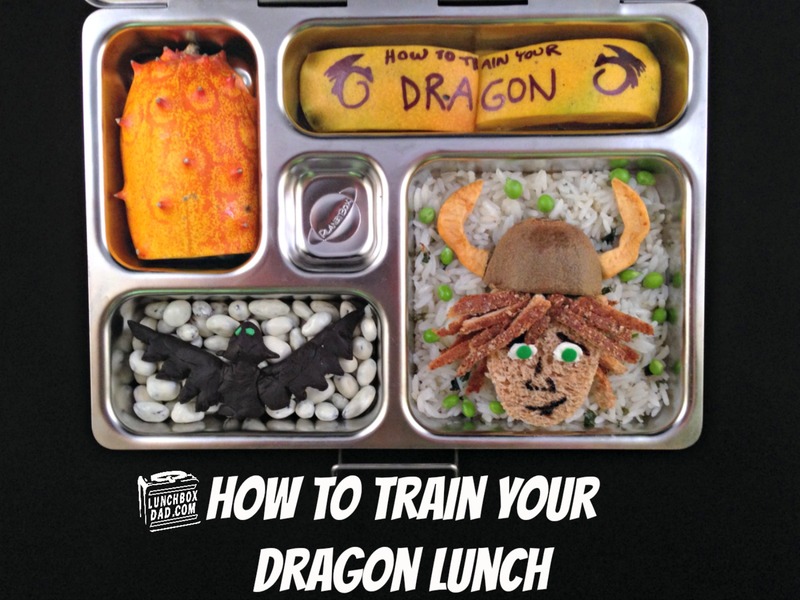 Write "How to Train Your Dragon" on the peel using food color marker. 5. 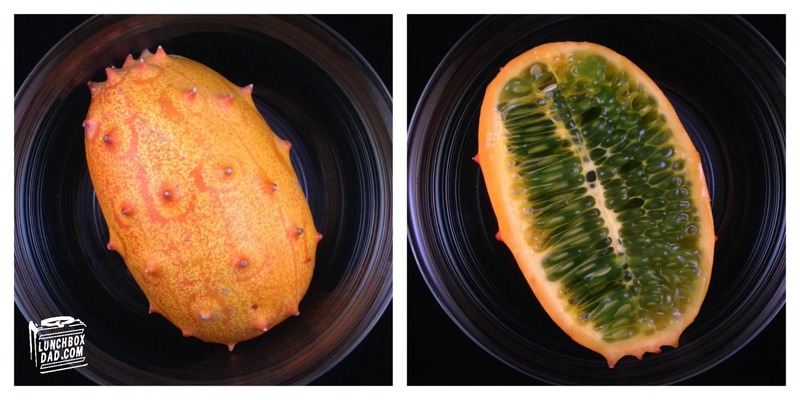 It would be ideal to use Dragon fruit but I found a Kiwano melon instead. Carefully slice it with a sharp knife and put it in a third side dish. Difficulty:10 Execution:10 Yum Factor: 10. Lunchbox Dad strikes again!